Thank you for planning a visit to the ABQ BioPark. Discounts available for military and eligible groups. Gates open 9 a.m. - 4:30 p.m. daily. Closed Jan. 1, Thanksgiving, and Dec. 25. No train service on Mondays or Dec. 24. Available 9 a.m.-noon, Tuesday-Sunday. 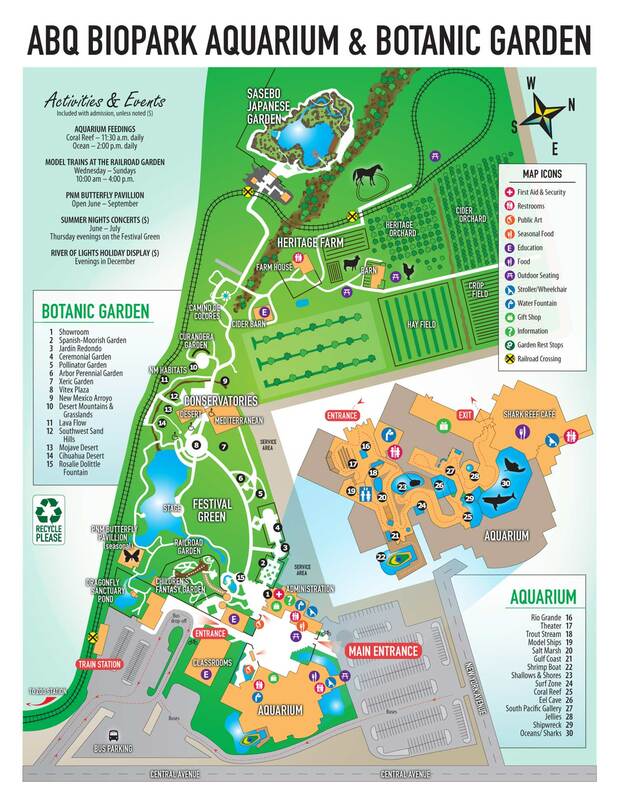 Includes Zoo, Aquarium and Botanic Garden admission and train rides. Trains do not run on Mondays. Notice: Trains don't operate on Dec. 24. 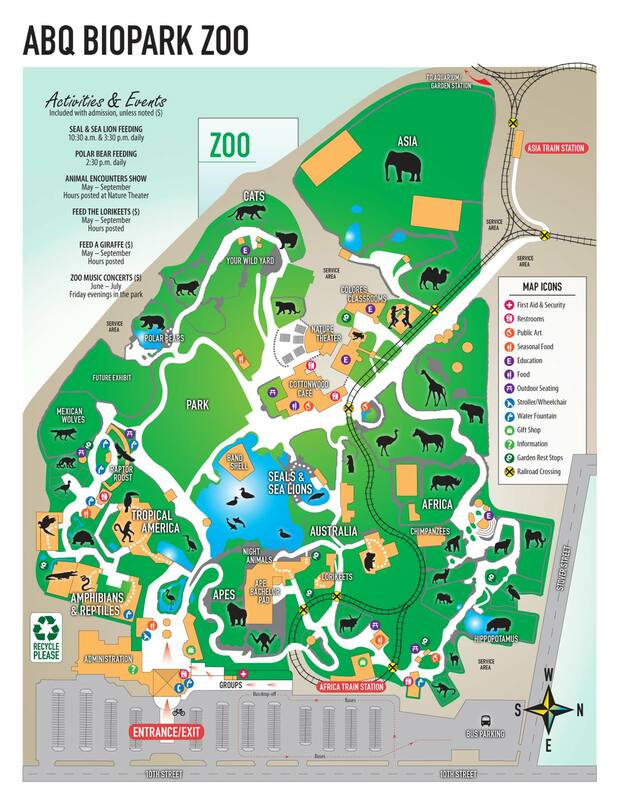 Zoo Train Rides: $3 adult / $2 child. Purchase at Africa Station. Member Train Pass: $3 Good for unlimited train rides. Purchase at ticket booth with NMBPS membership. Read More about the BioPark's trains. Single Admission includes the Zoo or Aquarium/Botanic Garden. Combo Admission includes the Zoo, Aquarium, Botanic Garden and unlimited train rides. Limited availability. Purchase or redeem 9 a.m. - noon, Tuesdays-Sundays, because there is no train service on Mondays and not enough time to see all three facilities after noon. We accept cash, check, purchase order, Visa, MasterCard, Discover, and American Express. Ticket booths are open from 9 a.m. until one half-hour before closing. You can buy tickets online anytime. Buy now or read more about online tickets. All tickets are good for one-day use. Same day re-entry is allowed with a hand stamp. Remember to get your hand stamped at the main gate upon exit if you intend to return later on the same day. The ABQ BioPark does not offer refunds. *The following qualifies as current proof of residency: current New Mexico driver's license or current utility bill in your name showing New Mexico address and a photo I.D. Available to active and non-active personnel with military ID. Available with membership card and ID.New Mexico BioPark Society members receive unlimited general admission and discounts to many special events. Available with membership card and ID.Half-price admission is offered to members of many gardens, aquarium and zoos across the US. If you are a member of a participating park, be sure to bring your membership card and photo ID. Check the reciprocal admission list. Reduced rates available for eligible school groups during the school year and recreation groups during the summer. Reservations at least two weeks in advance are required.